Search for all "3-beta HSD7 / HSD3B7"
Rabbit anti Human, Mouse, Rat 3-beta HSD7 / HSD3B7. Product is tested for Western blot / Immunoblot, Enzyme Immunoassay, Paraffin Sections. Immunohistochemistry on Paraffin Sections: 1/100. 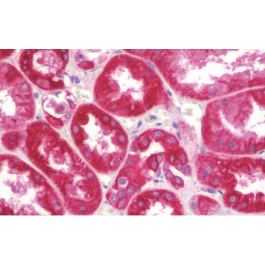 HSD3B7 is an enzyme which is involved in the initial stages of the synthesis of bile acids from cholesterol and a member of the short-chain dehydrogenase/reductase superfamily. The encoded protein is a membrane-associated endoplasmic reticulum protein which is active against 7-alpha hydrosylated sterol substrates. 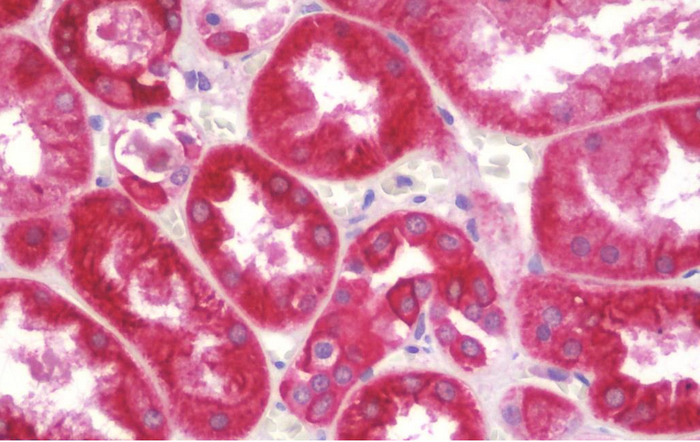 Mutations in this gene are associated with a congenital bile acid synthesis defect which leads to neonatal cholestasis, a form of progressive liver disease. 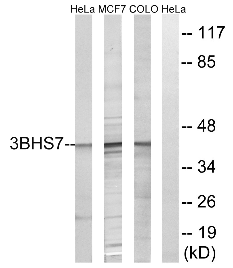 This antibody detects endogenous levels of total HSD3B7 protein.